Unfortunately it appears that the Sky-Vue will not re-open for the 2003 season. The theater has been sold again and parts are being sold off. An unfortunate end for a nice drive-in. As I find out more about the reason for the closing, I will post it here. Some of the equipment is going to the new drive-in in Freedom, WI. 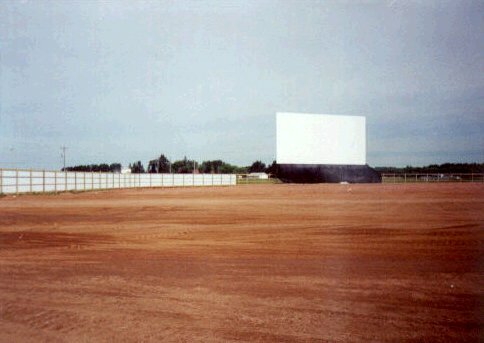 There is a brand new drive-in theater in the Wausau area!! New screen, building, and everything else! The theater was not quite finished when I was up there on the 2nd of July, 1999. Opening weekend was the weekend of the 4th. The theater runs first-run films and broadcasts on FM stereo radio. As I get more information on this theater, I will add it to this page. 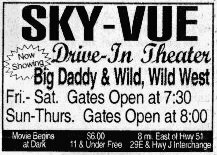 The theater is located on Hwy 29 about 5 miles east of the Wausau area on Cty J.
July 16, 1999: I made it to the Sky-Vue to see Big Daddy and Wild Wild West. The theater is still being completed, but is in operation. The FM sound is excellent and the concession stand is very nice. The screen is a brand new Selba screen, the oldest screen manufacturer in the business. 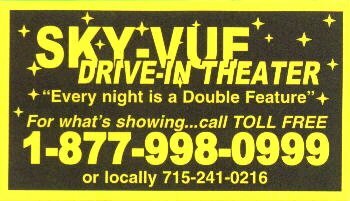 October 9, 1999: I made another trip to the Sky-Vue. The weather was perfect for movie watching. 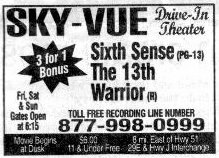 The movies for the night were Sixth Sense and The Thirteenth Warrior. 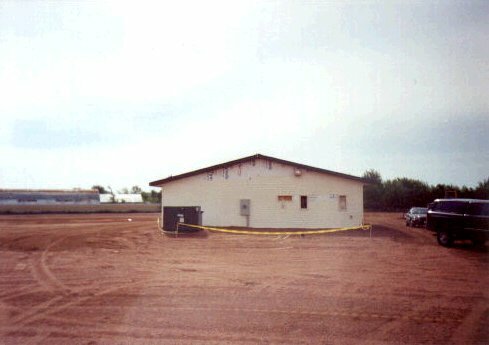 April 29, 2000: First stop on the Wisconsin drive-in 2000 tour. Features for the night: The Flintstones Viva Rock Vegas and Snow Day. The theater was very busy with most of the vehicles of the evening being the mini-van and the station wagon. There were plenty of kids in their pajamas either in or, in some cases, on top of the family car. September 16, 2000: A return trip and the features for the night were "Space Cowboys" and "The Perfect Storm". Beautiful weather for movies. Another moonlit night and comfortable temperatures. May 4, 2001: A beautiful night for movie watching and the features were "The Mummy Returns" and "Josie and the Pussycats". Pretty good crowd. 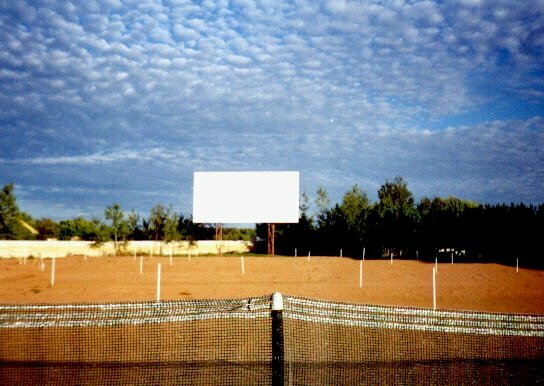 July 13, 2002: Nice weather for a night at the drive-in and the features were "Men In Black 2" and "Mr. Deeds". Very busy night at both screens. How to find the new theater. 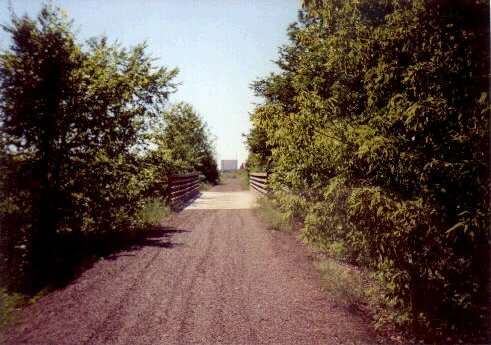 Picture from the Mountain-Bay state bicycle trail. Screen visible in distance. The screen and the freshly graded car ramps. 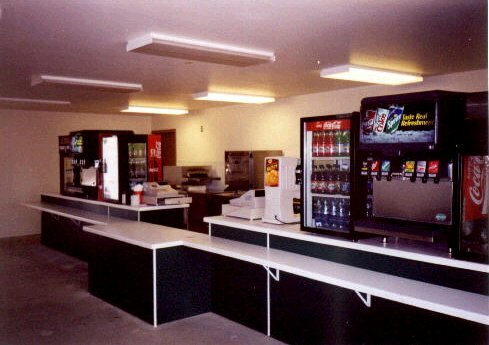 The brand new concession stand!